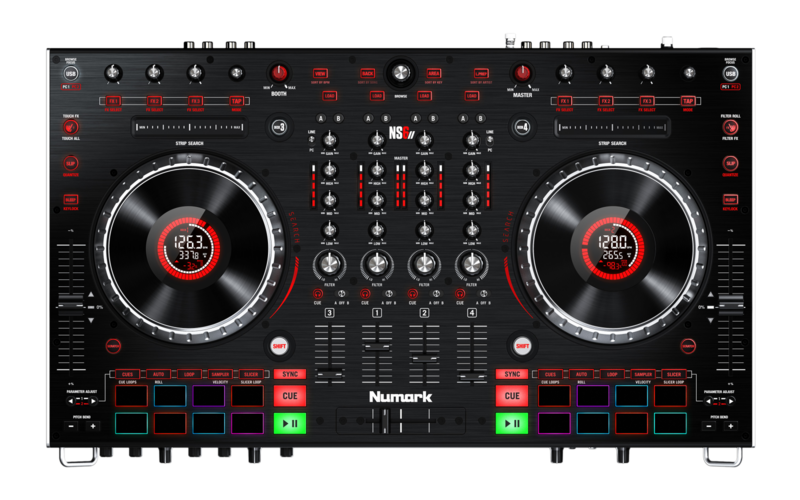 With the NS6II, dual USB ports allow you to connect two computers simultaneously, both running your DJ software and controlled by the NS6II. This means you can DJ with a friend or split the action between two different software titles. The article below will walk you through setting up your NS6II with Serato DJ on 2 different computers. Before we can connect the NS6II, we'll need to make sure that the proper drivers are installed. The NS6II is completely class-compliant for Mac, but driver installation will be required when using a PC. If you are using a computer with a Windows OS, please be sure to install the latest drivers first. This can be found on the NS6II product page, beneath the Downloads section on the right. Once the driver is installed, download and install Serato DJ. Unzip the Serato Software package and extract them to your desktop. Run the Serato DJ Setup file. Follow the onscreen instructions to complete the software installation. Note: The NS6II is only supported on Serato DJ version 1.9.7 and earlier. The software will be automatically unlocked when you connect the NS6II to your computer. No setting adjustments are necessary and all NS6II controls will automatically and instantly map to the associated Serato DJ controls. The NS6II allows two computers to connect to the unit simultaneously. Each port is completely independent. It is possible to run Serato DJ on one computer while running third-party software on the other, Mac or PC. This allows two DJs to play together and supports uninterrupted transitions from one DJ to another. 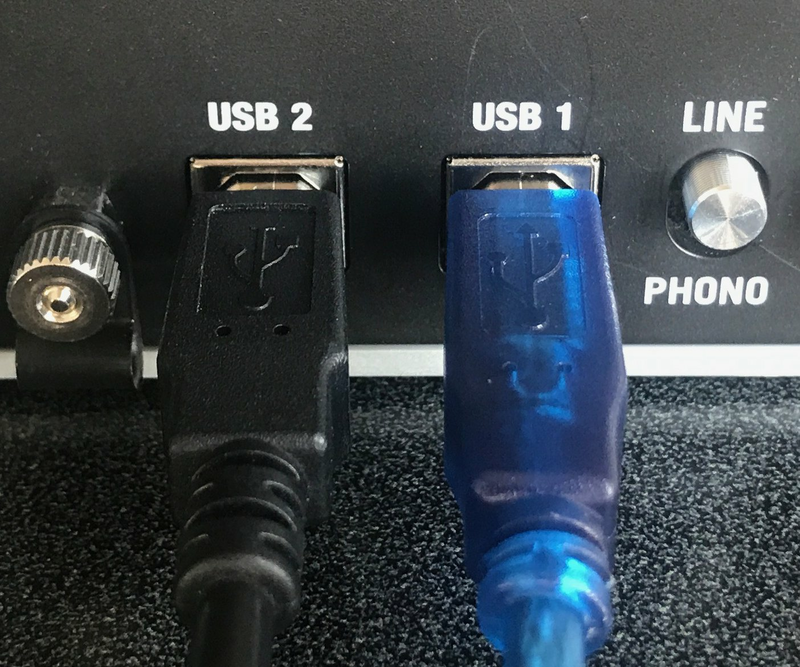 Connect a second computer (PC2) to the unused USB port on NS6II’s rear panel. Once the computer is connected (PC2), the software on that computer will show all decks offline (IN USE). The first computer (PC1) will still control both sides of NS6II. Before giving PC2 control of one side of NS6II, make sure no audio is playing from PC1 on that deck, as it will go offline. Then, press and hold Shift and press the Browse Focus / PC1/PC2 button on the non-playing deck. 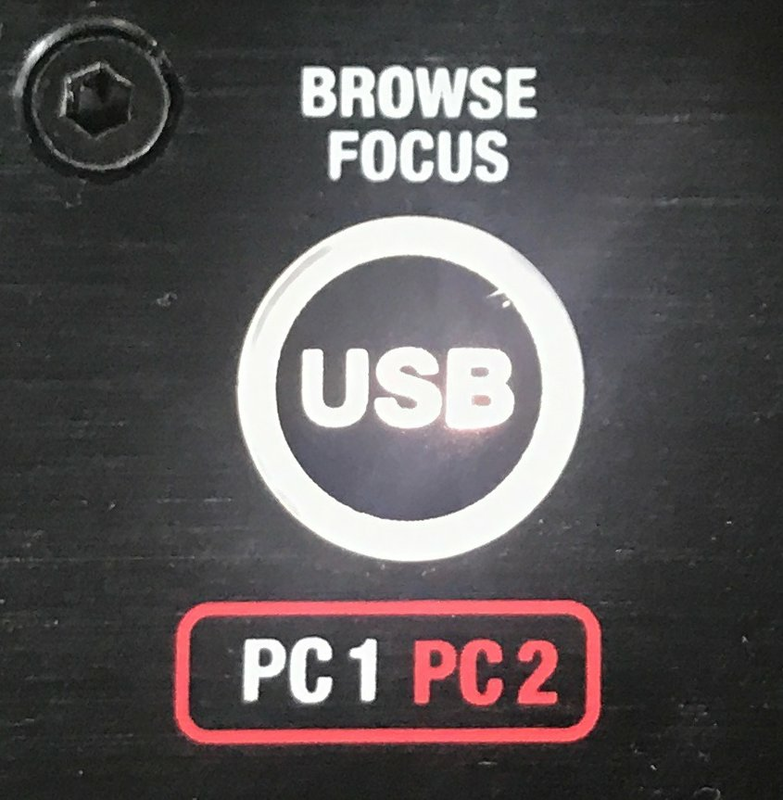 While on PC1, the USB/Browse Focus button will be lit WHITE. 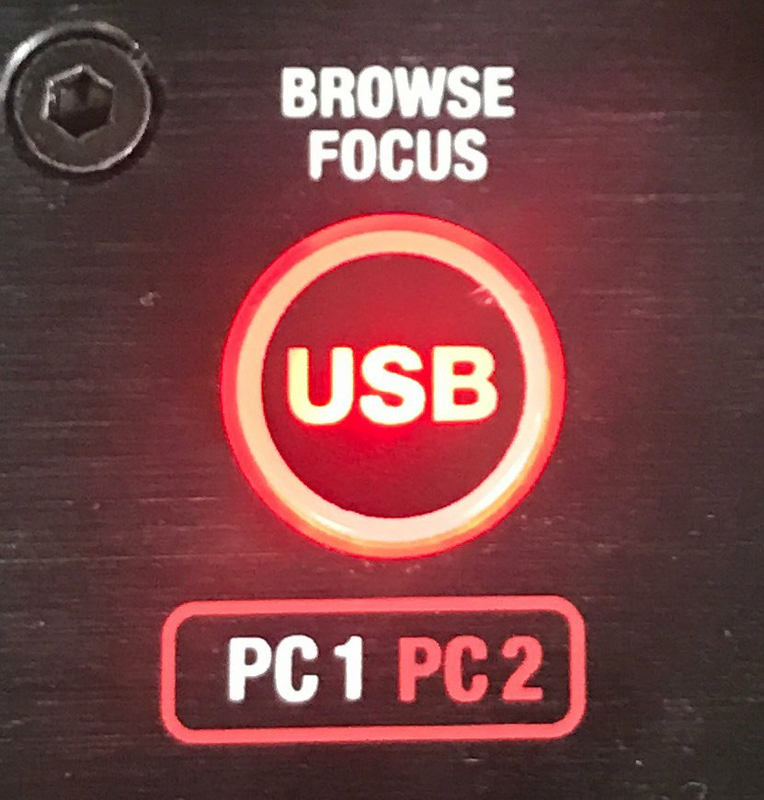 While on PC2, the USB/Browse Focus button will be lit RED. The software will show all decks online on the PC you selected. PC2 will now control the two channels on that side of the controller, and will automatically have the focus of the browse controls. Use the Browse Knob to scroll through the library, then add the desired track to the deck by pressing the Load button. Play a track on PC2’s deck and mix it in when ready—you’ll now have audio from both computers in the mix. For example, while PC1 uses Deck A (and the mixer controls for Channels 1 & 3) to control their computer, PC2 can use Deck B (and the mixer controls for Channels 2& 4) to control their computer. 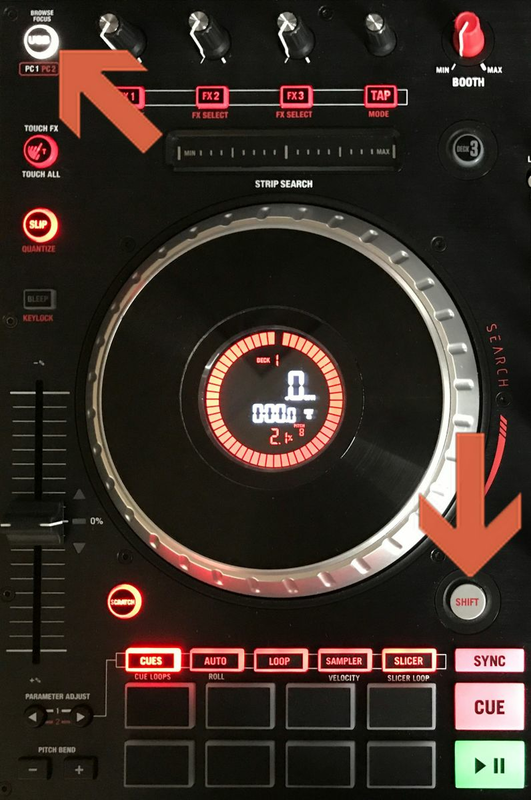 With one computer controlling each deck, press the Browse Focus / PC1/PC2 button on the non-playing deck to switch control of the browse knob. Fade out the audio playing from PC1’s computer to the audio playing from PC2’s computer.When only the audio from PC2’s computer is left in the mix, press and hold Shift and press the Browse Focus / PC1/PC2 button on the non-playing deck. Now, PC2 is using both Decks A and B to control their computer. You can now disconnect PC1’s computer from NS6II.